A lengthy bull market and a fiduciary rule requiring investment advisors to act in the best interest of their clients - the necessity of which surprised many investors who erroneously thought that had always been the case - has driven lower priced passive funds. 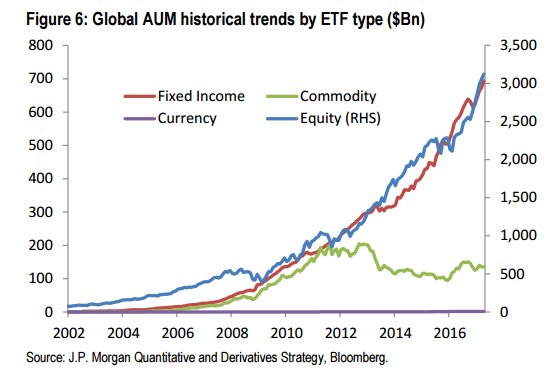 The relative failure of active investors, especially in the hedge fund industry, as well as growing comfort with the benefits of algorithmic investments has also fueled the rise in passive investments. The world’s largest money manager oversees almost $1 trillion more investor cash now than it did a year ago. BlackRock Inc.’s BLK 1.41% assets under management climbed to $5.98 trillion at the end of September, helped by rising equity markets and billions of dollars flowing into its large lineup of exchange-traded funds. That compares with $5.12 trillion in assets under management a year prior, continuing the New York firm’s ascent. BlackRock and rival Vanguard Group, the two largest money managers globally that also boast the largest stables of ETFs by assets, have garnered an unprecedented amount of new investor cash as investors increasingly embrace the low-cost products. The two firms now manage about $10.7 trillion, almost as much as the gross domestic product of China, the world’s second-largest economy at $11.2 trillion in 2016. Money managers have become a more powerful force than ever since the financial crisis as banks scaled back. They have a growing say on market structure and corporate governance matters and play a bigger role in Wall Street’s product development and plumbing. “It’s humbling,” BlackRock Chief Executive Laurence Fink said of his firm’s growth in an interview. He expects even more money to flow into ETFs in the coming three to five years as a result of new regulations in Europe and the U.S. “I think that’s the backdrop we’re living in,” he said. In the U.S., the Labor Department’s so-called fiduciary rule requires stewards of retirement assets to act in their clients’ best interests. It has accelerated a continuing shift toward fee-based advice and, in turn, broader adoption of lower-cost funds as advisers charging a percentage of assets try to keep other costs down. Europe’s sweeping Markets in Financial Instruments Directive, meanwhile, is expected to improve pricing and trading transparency in the fund industry, which some market observers say could spur wider ETF adoption. Rising equity markets bolstered BlackRock’s assets under management and better fund performance helped boost its performance fees in the third quarter. Mr. Fink said performance fees rose in part because of the success of its European hedge-fund business. Some 41% of the firm’s traditional active equity assets underperformed their benchmark, or peer median, over one year, compared with 50% a year earlier. Over three years, 20% of assets underperformed, compared with 34% at the end of September 2016. In the firm’s so-called scientific active equity or quantitative equity products, performance improved more markedly. Over one year, 14% of assets underperformed their benchmark or peers, compared with 69% at the end of the same quarter a year ago. Over three years, 11% of assets underperformed over three years, compared with 17% a year earlier. Blackrock’s revenue of $3.2 billion was up 14% from a year ago. Technology and risk management revenue, powered by Aladdin, grew 15% to $175 million. Mr. Fink said he expects continued “double digit” revenue growth from that technology. Investors plowed nearly $300 billion into Vanguard Group funds in the first nine months of this year, nearly matching flows into the firm for all of 2016 in the latest affirmation of the primacy of low-cost “passive” investing. The torrent of investor money extends a winning streak for the Malvern, Pa. firm, which has emerged as one of the chief beneficiaries of Americans’ unprecedented embrace of index funds during an eight-year-old U.S. stock bull market. Vanguard has been the fleetest firm among many on Wall Street in offering consumers cheap, easy ways to act on a simple idea: Most actively managed mutual funds trying to pick winning stocks don’t perform well enough to justify the fees they charge. The concept, embraced by Vanguard founder John C. Bogle in 1975, has since spread in varying degrees into a host of other asset classes, from bonds to currencies. In some of these markets, the rise of passive products has only recently begun. “It’s a high cost/low cost debate,” said Vanguard Chief F. William McNabb III in an interview Tuesday. “Last year was one that I never thought we’d see again,” in terms of firmwide flows, he added. Vanguard’s assets topped $4 trillion for the first time at the end of January and have continued their upward climb since, now reaching $4.7 trillion. The firm’s rise and the growth of passive investing broadly are prompting changes spanning the financial world, from corporate governance to market structure. At the same time, many investors fret that the so-called passive revolution that has fed the growth of Vanguard and rivals such as BlackRock Inc. is itself creating a series of structures that haven’t been tested and could be vulnerable to unpredictable behavior in a downturn. “I don’t think that there’s much that changes these flows until we have a negative market,” said Daniel Wiener, editor of the Independent Adviser for Vanguard Investors, an independent newsletter that follows Vanguard funds. “I can’t tell you when that happens, but when it does there will be a lot of very surprised investors,” he added. Mr. McNabb acknowledged that a sharp downturn would “certainly” cause investors to dial back their investments in the stock market. Such a move could at least slow down the surge of money into passive investments. Vanguard long set itself apart as firm owned by its fund shareholders that offered rock-bottom fees and refused to pay for distribution of its funds. It started the first index fund for retail investors 40 years ago. 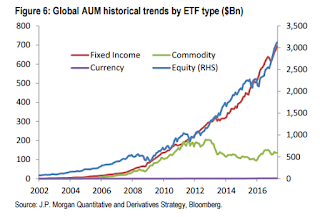 This year, some $516 billion has flowed into U.S. mutual funds and exchange-traded funds, according to research firm Morningstar Inc., with the vast majority of that investor cash flowing into index funds such as ETFs. Vanguard and other large index-fund providers have benefited most recently from a new set of retirement advice rules from the Labor Department. The future of those rules is unclear, but they have already accelerated a continuing shift to fee-only advice in which wealth advisers recommend portfolios comprised of low-cost funds. That potential change has triggered a winnowing down of the mutual funds on offer at large brokerage firms, and a shake-up in the funds on offer through workplace retirement and health savings plans. In some cases, Vanguard’s funds have replaced pricier products offered by its rivals. For example, HealthEquity, a health savings account provider, told customers it was overhauling the lineup of funds on offer because of the Labor Department rules. It plans to replace more than 100 funds run by firms including Fidelity Investments, Dodge & Cox and Pacific Investment Management Co. with roughly two dozen index-tracking Vanguard funds with comparable investment strategies, according to its website. Vanguard posted $323 billion in inflows a year ago and the total sum of new money Vanguard has received this year—a net $291.7 billion through September, according to a spokesman—means it is likely to eclipse that record well before the end of the year. Of the firm’s total net new cash through the end of September, about $263 billion has flowed into funds that track the performance of indexes and the rest was invested in funds run by human stock and bond pickers. The biggest casualty from the rise of Vanguard and other passive investments over the past decade has been funds that charge higher fees for the chance to beat the market. Mutual-fund companies have sought to merge, cut fees and overhaul their product lineups to respond. Even the most sophisticated investors have felt the pinch of passive’s rise. The $3 trillion hedge-fund industry roughly doubled in size after the financial crisis, helped by six consecutive years of overall inflows starting in 2010. With memories of the downturn fresh in their minds, wealthy backers like pension funds and endowments were willing to pay up for the promise of protection in future trouble. After hedge-fund performance badly lagged behind the current bull market, however, investors pulled their cash. The industry posted inflows in the most recent quarter, but in the six previous quarters, investors took money out, according to researcher HFR. At Vanguard, the rapid growth has at times strained its customer service, prompting the firm to grow the staff that works with its retail customers by about 25% over the last 18 months. It is also investing in a more user-friendly mobile and other digital platforms, according to Vanguard CEO Mr. McNabb. Mr. McNabb will step down from his CEO role in January, but remain chairman. His successor, Mortimer J. “Tim” Buckley, is a one-time assistant to Mr. Bogle. In taking the helm of the firm, Mr. Buckley faces the challenge of continuing growth overseas, managing the customer service challenges and finding ways to compete with rivals that have increasingly found ways to compete with the firm on price. Rivals including BlackRock Inc. and Charles Schwab Corp. have matched or bested the firm on fees, particularly in ETFs and other index-tracking funds to compete for investor cash.